After some disappointing attempts to load this round, I think I finally cooked up the correct subsonic load for my barrel lengths. .223rem brass cut and formed, sized and trimmed to 1.358"
Overall length seated to 2.190", with a light taper crimp. I'm pulling an average velocity of 1007-FPS with a 16" barrel. 887-FPS with a 10.5" barrel. Obviously, this is a Subsonic load. Not good for general hunting as the Sierra SMK bullet may not expand very well. Although it's a hollow point, it's really designed for target shooting. I had some problems with failure to feed with some of my loads I did to test velocities. Turns out that I had some crappy PMP South African brass mixed in with my Federal, Remington, PMC, and Fioochi brass. It tooks some time to filter out those crappy PMP rounds, as I had prepped over 1,200 rounds of brass. Although the original load data had the overall length at 2.600", it had issues feeding from my Magpul Pmags. I think this length was originally set for Thompson Contender barrels and the lengths were originally for the 300 Whisper. The recent data I found has the case length at 2.190" so it does feed better. Now that my subsonic load is finished, I need to work a load for hunting. I am considering the Hornady A-Max 110 grain and Speer TNT JHP 125 grain. Both are the most price conscience (under .25cent per projectile), and readily available in most stores. Any thoughts on this? where were you seeing the 110gr amax? im using 125 ballistic tips because thats what PNW arms uses for their hunting rounds and its reasonably priced at 17 bucks per 50 rounds. I have not found any 110gr Vmax. I just saw the load data so I thought I would try to find them. No luck. I did buy 200rnds of 125 ballistic tip and will work with that. My Hornady case prep center took a dump on me. It's going to get shipped back tomorrow for some new gears. In 2 weeks I will start up again. does your subsonic load lock back the bolt after the last round? It does lock back. However I am finding that I'm getting a lot of blowback. I'm getting sandblasted by debris coming out of the ejection port. It may be unburned powder. I'm debating if I want to risk dropping the powder charge from the min of 10.5 to maybe 9.5.
i'd try it. Worst case you have to pound out a squib stuck in the barrel. Not THAT big of a deal. shot my supersonic (hunting) load yesterday. 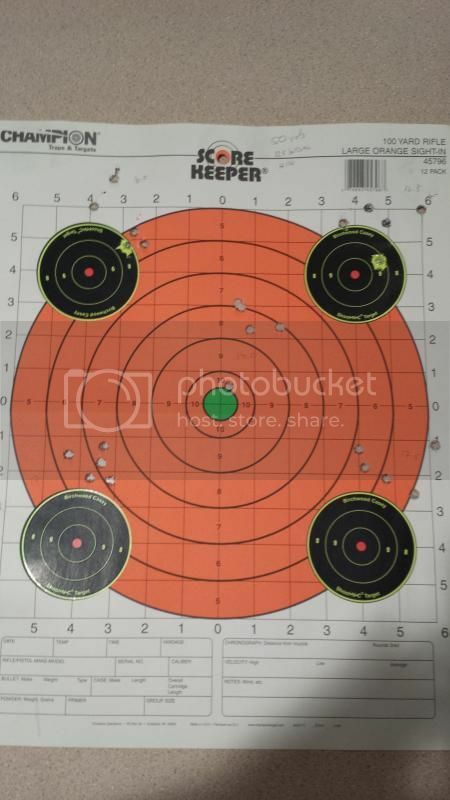 At 50yds my best group was probably 3 inches so it definitely needs some tweaking. I might make the OAL longer and add a crimp to it and see if that helps. 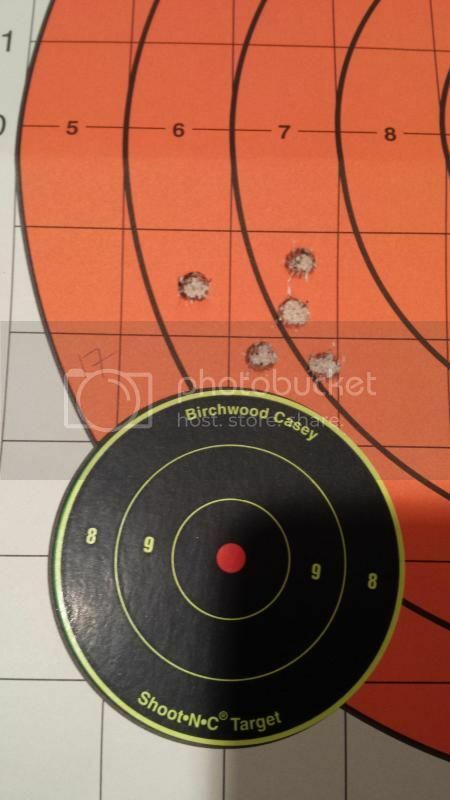 Here are pictures of the target and a closeup of the best group. I was flipping around www.300BlkTalk.com and found several postings of guys using their 9mm suppressor to run subsonic 300 blackout rounds. This was interesting to me as I was about to spend $600 for a 30cal suppressor and $200 for the federal tax stamp. Instead, I was able to order a thread adaptor to convert the 5/8-24 threads on my barrel, to 1/2-28 to match my AAC Evo9 suppressor. A steal of a deal at $40 for the adaptor, and I picked it up from DSK Armory. The one that have looks like this, but is matte black finish. I was still skeptical about this, so I called AAC (advanced armament) and they verified that I can shoot subsonic 300 Blackout rounds out of the 9mm suppressor, so long as it's not full auto or crazy pressures. Thats awesome! Do you need a stamp for each suppressor?